Cream Bun refers to one of the delicious but simple snacks sold in Teashops (Chaya Kada) in Kerala, India which is made from a sweet bun, a brioche-like soft bun filled/stuffed with sweetened whipped cream. These Cream buns also sometimes called Cream Bread are usually eaten with hot Masala or Cardamom Tea and also with Black tea or Hot Coffee. I discovered these Cream Buns, below, in many Chaya Kada (Teashops) and Bakeshops/Bakeries while on vacation in Allepey, Kerala, India. I love it, very simple invention. I enjoyed it with Cardamom Tea. I intend to prepare something like this in Germany. Below are pictures of this simple sweet snacks from Allepey. Below is a close up view of the Cream Bun and another one I opened so you can see the sweetened whipped fresh cream inside. Cheru Payaru Parippu Thoran or Cheruparippu Thoran is a dish from Kerala, India made from Mung beans stir-fried in fresh grated coconut, onions, spices and Curry leaves . 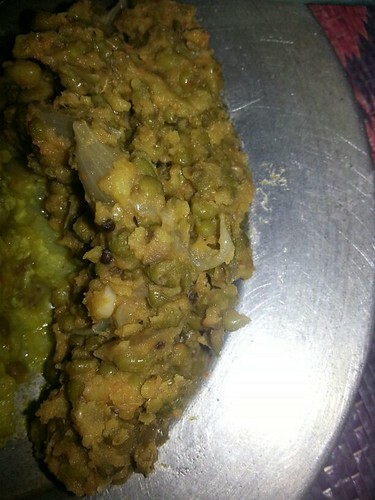 Mung beans is called Cheru Payaru, Cherupayru and Cherupayaru Parippu in Malayalam. They are available in whole or spilitted versions. and green and yellow colors. In Allepey, a district in Kerala, it is one of the cheapest beans available in the markets. Below is a picture of a tasty Cheru Payaru Parippu Thoran. Very similar to the Philippines Ginisang Munggo except that in the Philippines, we dont use Kadugu (mustard seeds) and Curry Leavs, but some are also adding Coconut milk (called Gata in Filipino) when cooking Ginisang Munggo. Cheera Thoran is one of the dishes from Kerala, India, Spinach (Cheera) stir-fried in grated Coconut, lots of spices and Curry leaves . Shown above picture is my Aunt Lily cutting the Cheera finely. Muttakoos/Muttakoose is the Malayalam word for Cabbage. But they mostly call it in its English name. Cabbage (Muttakoos/Muttakoose) and Papaya Thoran is also called Cabbage (Muttakoos/Muttakoose) and Papaya Poriyal in Tamil Nadu, another State in Southern India. Below is a picture of Cabbage (Muttakoos/Muttakoose) and Papaya Thoran prepared in Allepey, Kerala, India. I can see the Curry leaves, I am missing it on my food. Cherupayaru Olarthiyathu also called Cherupayaru Ulartthiyathu, Cherupayar Olarthiyathu, Cherupayar Olarthiyathu or Cherupayaru Olarthu refers to a dish from Kerala, India made from stir-fried cooked Cherupayaru or Moong/Mung Beans or Whole Green Gram. Cherupayaru Olarthiyathu is usually served with Puttu (steamed rice cake) or Kanji, rice porridge from Kerala. Picture below of the Cherupayaru Olarthiyathu prepared by my friend in Allepey, Kerala, India which they served to me with Kanji.